This is a student worksheet and teacher guide for programming the Raspberry Pi GPIO ports using Python. It is based around a simple electronic circuit using LEDs. At the end the learners will have created a simple LED traffic light, with suggestions for how it could be turned into something more fun. 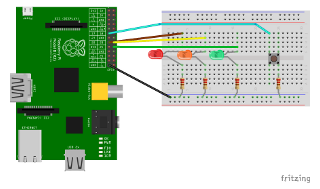 This guide was created for use in an after school Raspberry Pi club. It could also be used in school lessons with secondary school children. These documents by Stewart Watkiss are licensed under a Creative Commons Attribution-ShareAlike 4.0 International License.